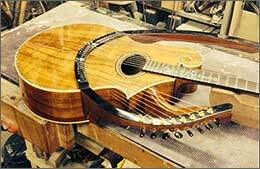 I have been repairing instruments as long as I’ve been building them. It is not only an essential part of the business, but it is good to be able to bring out the best in other makes. I haven’t yet come across a repair that I haven’t been able to do from a technical point of view, but sometimes it isn’t always economically viable. Broken head stocks can usually be repaired invisibly. I have even repaired an Ovation which was blown up by a stage bomb, and was delivered to me in a bin bag! I stock a huge variety of fret wire for re-frets – one of the most common repairs, – as well as re-seating loose frets, stoning and re-contouring them. Occasionally, I have to replace broken truss rods – a tricky repair and one which can fall under the ‘uneconomical’ heading. Therefore, I always ask guitarists not to meddle! Another common problem is acoustic bridges pulling away from the table, which is mainly caused by the tension on the strings distorting the shape of the table. 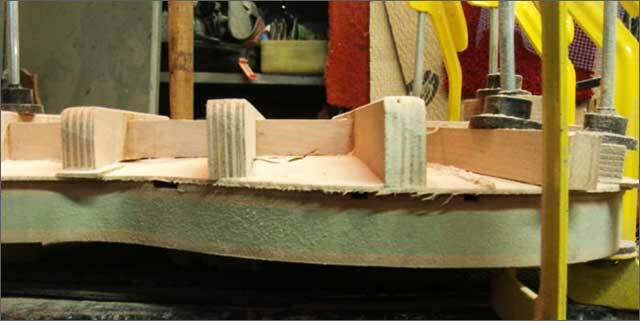 Something has to give, and it is normally the glue joint! Not only is this fixable, I have even developed a system for taking the stress out of the bridge table. I stock a variety of materials for replacement nuts, including phenolic resin (black), real bone (courtesy of a friendly butcher! ), brass and ebony, for the few guitars with wooden nuts. For inlay work I also stock Mother of Pearl, Abalone and a small amount of ivory. The ivory was obtained from a very old piano, and is not a material I would ever buy new. I also have a variety of plastics for scratch plates and edge binding, etc. for new builds and repairs I stock a number of exotic hard woods, including ebony, different varieties of rosewood, maple (rock, plain, figured and bird’s eye), padauk and walnut. In short, whatever the repair, I have the facilities, the equipment, the hardware and the ability to restore it to its former glory – or better! Many times a customer is unable to actually see where or how the guitar has been repaired, such are my abilities. If your instrument is in need of some loving care, please don’t hesitate to bring it along where I’ll be happy to give you an estimate and a timescale to complete the repair.